Clear crystal is cut, beveled and joined to create an outlined, curved 5 point star. The slant top of the black crystal base gives the illusion of the star rising out of it. Personalize the star, the base or both to honor the rising stars in your organization. This premier crystal star is packaged in a velvet lined gift box for added elegance. Mounted on a blue crystal base, this elegant clear crystal has plenty of room for personalization. The beveled edges frame the personalization area to make this a perfect award to recognize and honor achievement. This premier crystal is packaged in a velvet lined gift box. This Crystal Pershing Globe Award is an ideal way to recognize the ultimate in achievement. A highly detailed large crystal globe sits atop of wide crystal pyramid shaped base allowing for plenty of area for personalization. The product stands 6 3/8" tall and is perfect for just about any on your award needs. Imagine the expression of the person when they see their name on one of these impressive awards. The personalization area of this premier crystal plate is framed all around by diamond cut facets that give it a prism affect. The unattached base features posts at both the front and back to hold the plate securely in place and also has room to personalize. Packaged in a lined gift box for added elegance and available in 2 sizes, this stunning plate is a unique acknowledgement of excellence that anyone would be proud to receive and display. Plate 7" diameter, Base 4-5/8" x 2-1/8" x 3/4"
Plate 7-3/4" diameter, Base 5" x 2-3/8" x 3/4"
The beveled edges on this 1-1/4" thick crystal give it a rounded look. 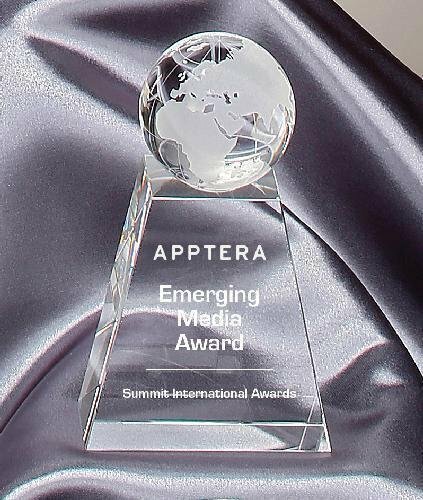 Mounted on a sapphire blue crystal base, this crystal has a large personalization area, making this an elegant, simple award for excellence. This premier crystal is packaged in a velvet lined gift box.